Tony Stark (Robert Downey Jr.) takes a desk job. 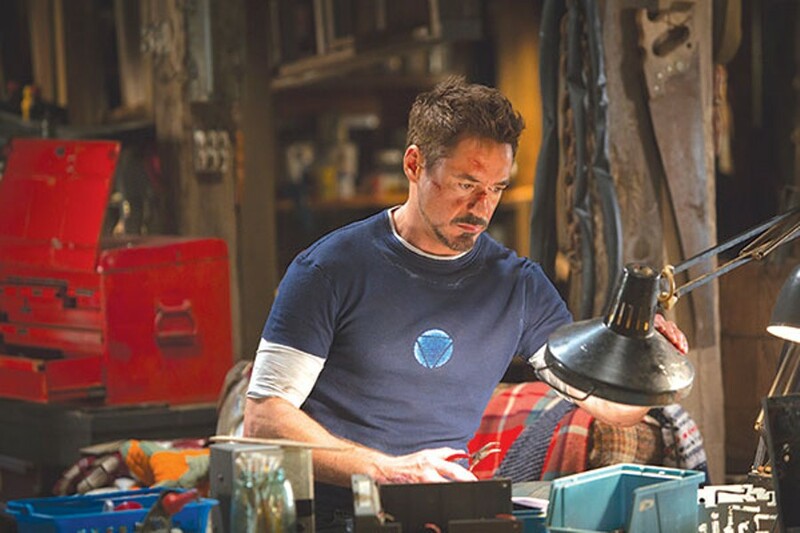 In Iron Man 3, inventor and part-time superhero Tony Stark (Robert Downey Jr.) is still shaky from the events depicted in The Avengers. (I'm still a bit annoyed by the junk-fest that was Iron Man 2.) He's self-medicating by tinkering with his Iron Man suits, but not for long! A dastardly villain known as the Mandarin (Ben Kingsley) blows up Stark's home-slash-lab. This leaves Stark wandering in the wilds of Tennessee, gadget-less and forced to rely on his inner strengths. That's the stated premise, anyhow, but Shane Black's rock-'em-sock-'em flick finds plenty of loopholes for the display of gadgetry, special effects and assorted comic-book-style badassery. Downey has fun playing a self-aware Stark, who gets that he's a joke but still loves delivering it. Iron Man regulars (and Downey straightmen) Gwyneth Paltrow, Don Cheadle and Jon Favreau check in. There's a second villain, played by the usually deliciously off-kilter Guy Pearce, but that performance falls oddly flat.